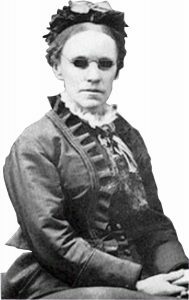 Fanny Crosby was born in the USA on March 24, 1820, and became blind at the age of just six weeks. 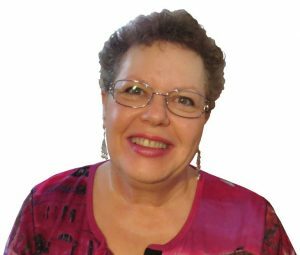 As an adult, she became a teacher at a blind school. She was a passionate supporter of missionary work in the USA, especially in the slums where she lived in later years. 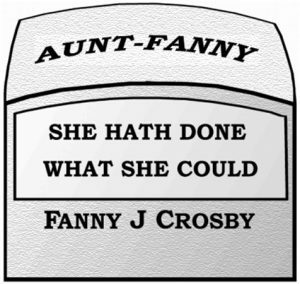 Fanny is best remembered though, for her lyrics: around 9,000 of which were made into hymns and over 100 million copies of her music were printed. By the end of the 1800s, she’d become a household name. Most American hymn books and many Australian ones as well, contain hymns that Fanny wrote. While Fanny didn’t write the melodies, she wrote the words. In fact, Crosby claimed that “Spring Hymn” was the only hymn for which she wrote both the words and music. In addition to the nearly 9,000 lyrics for hymns, Ms Cosby also had four books of poetry published and wrote more than 1,000 secular poems. Before she began writing hymns, Fanny co-wrote more than sixty secular songs, some of which were huge hits in their day. Fanny Crosby also co-wrote the very first American opera called “The Flower Queen” which was a cantata. While writing in those early years, Ms Cosby continued to teach at a blind school in North Reading. Fanny was a strong supporter for the abolition of slavery and wrote in support of Abraham Lincoln and his fight to end slavery. She wrote quite a number of political items as well. Due to her disability, Fanny struggled to write legibly, so her friends and family wrote her words down on paper for her. Oftentimes she would have several hymns floating about in her mind at the same time, and could compose several in a day. On March 5, 1858 Crosby married Alexander Van Alstyne Jr, a man who she’d met while teaching. In 1859 they had a daughter Frances who died in infancy, possibly from SIDS (sudden infant death syndrome) which at the time wasn’t understood. It is understood that the marriage became unhappy after their daughter’s death, and though they remained married, Fanny and her husband didn’t live together for a couple of decades. Fanny was extremely passionate about supporting and helping the poor, even going so far as to live in their slums where she worked with them, for the last couple of decades of her life. 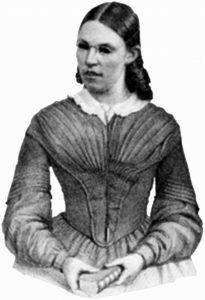 Though Crosby had written the lyrics to thousands of hymns, many under different names, she often struggled financially. The financial stress was due to copyright rules at the time, which exploited poets and song-writers, especially women, and gave the rights to hymns and other music to the composer of the music, rather than the lyricist. Crosby was paid only a fee of one or two dollars per song or poem and never anything more. One of Crosby’s goals was to win a million people to Christ through her hymns, and whenever she wrote her lyrics, she literally prayed it would bring women and men to Christ. Even though Fanny Crosby is best remembered for her hymn-writing, she preferred to be remembered for her missionary work.